Here are how the Brewers prospects fared who were participating in the now-completed Arizona Fall League season. *Kyle Wren was just acquired by the Brewers via trade. He did not play for the Glendale Desert Dogs during this AFL season, but as he is now a Brewers farmhand, I’ve included what he accomplished there this fall. **It should be noted that Tyler Wagner had one blow up appearance that skewed his ERA, BAA, WHIP, etc. For the most part, Wagner pitched well. Without his October 28th appearance (0.1 IP, 8 ER) on the fall Wagner would have posted a 2.08 ERA. What If Suspensions Were Served Against The Teams They Were “Earned” Against? When the discipline from the Easter Sunday incident in Pittsburgh was meted out on Tuesday, I had an apostrophe…lightning had just struck my brain. In situations where teams play each other again in the same season, would suspending for the next time the teams play make sense? The basic reason behind my idea? 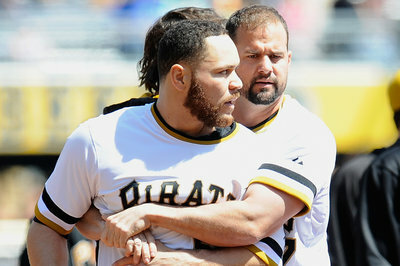 Because, for example, Gomez “got in trouble” against the Pirates. So why should that benefit the Padres, Cubs, or anyone else? So my premise is a simple one. 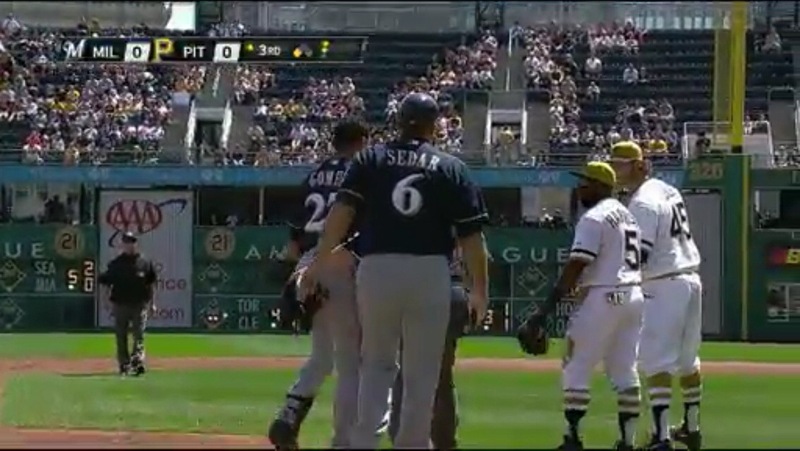 Carlos Gomez and Martin Maldonado were suspended for an on-field altercation against the Pittsburgh Pirates. 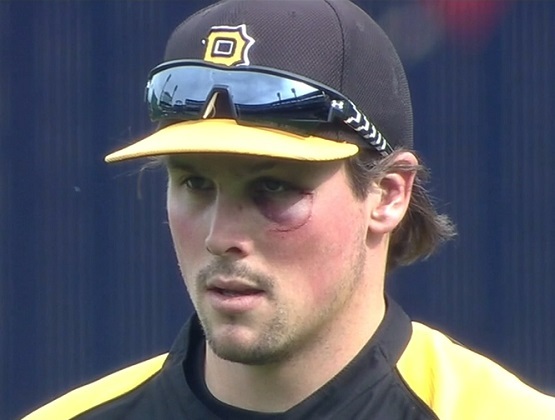 Travis Snider and Russell Martin (though somehow not Gerrit Cole) were suspended for the same on-field altercation against the Milwaukee Brewers. Wouldn’t it make more sense to have the punishment(s) be served when the same two teams squared off again? There are certainly problems with the idea, including the “what ifs” of the suspended player being traded or sent to the minors or somehow not with his team that next series. And you’d have to consider how (if at all) the punishment being delayed affects the effectiveness of it. Furthermore, if the teams don’t play again the same season, I don’t think works nearly as well. But there are many reasons that this would be a good thing, in my opinion. Let’s explore some of them. 1. The punishment doesn’t benefit random opponents. This is especially pertinent to the basis of the argument. The bottom line is that the Pirates and Brewers got into it and suspensions were the result. 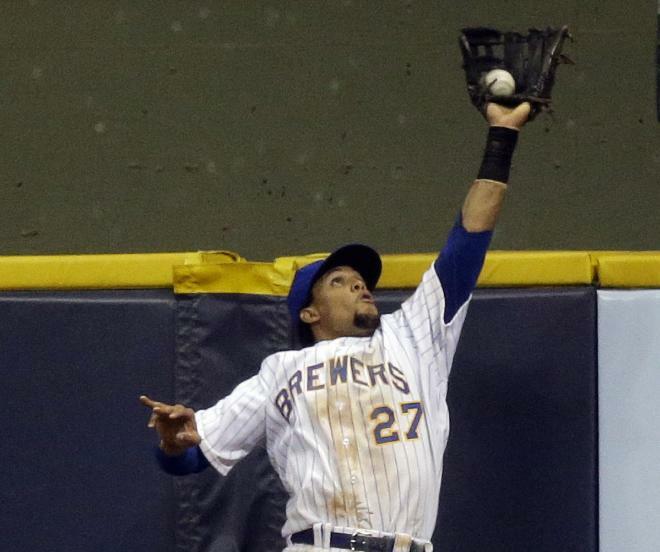 So why should the Brewers play short-handed against teams other than the Pirates? 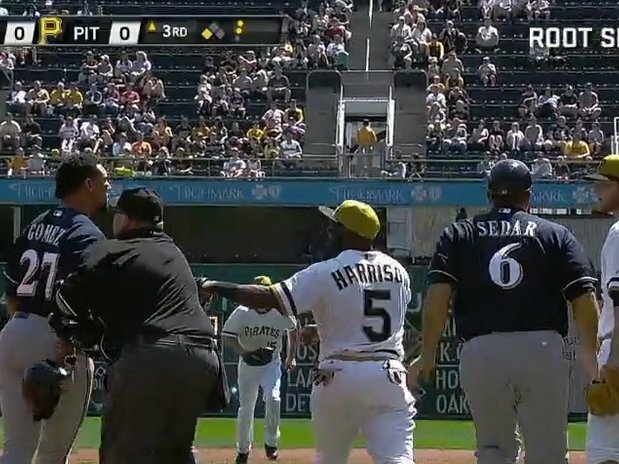 Shouldn’t Gomez and Maldonado’s absences hurt the Brewers against Pittsburgh since tempers flared at them? Likewise, why should anyone except the Brewers benefit from Pittsburgh being short Russell Martin and Travis Snider? 2. Players could still appeal length, but this would put an end to seemingly (at times) random scheduling of the hearings and give more of a definitive feel to the punishment, along with quicker decisions. In the past (and possibly still today?) players would have the appeals heard the next time they played in New York, out of convenience. The Brewers play the New York Mets in Flushing in early June. Could the league really wait that long to decide on Gomez’s appeal? If so, he’ll have played in a lot of games between last Tuesday and then. In my opinion, if you don’t mind that he gets to appeal for weeks, then you shouldn’t mind waiting to serve the suspension until whenever the next time two teams play is. 3. The teams involved would know when the suspensions would be served. This does benefit the teams to a degree. In our working example, both teams had catchers suspended. This would allow for some manipulation of off days to make sure the teams’ other catchers were rested for the known suspension days, but in circumstances like Maldonado’s whose suspension was for five games, he’d missed a full series and then part of the next one on top of that. 4. It also guarantees that suspension earned concurrently would be served concurrently. Nothing seems more out of place to me than one guy appealing and one guy serving so that the suspensions don’t overlap. The actions certainly overlapped, so why shouldn’t the punishment? Want to curb some of the participation in these on-field altercations? Making players serve suspensions at the same time might give them pause…at least the next time if not the first time. And maybe that’s enough to avoid some of the physical fallout. So again, I understand that there are holes in this idea, but few ideas were perfect at their concept. What are some added benefits you foresee? What are some problems you can think of? Are any of them dealbreakers? Thanks for indulging me in this mental exercise. I finally got around to watching MLB Network’s Top 75 Defensive Plays of 2013. The Brewers were involved on the positive end of five (5) of them. Here they are with brief descriptions of situation, players involved, and impact (if any). #73 – Segura Flips to Gennett – September 11, 2013 – With runners on first and second, this double play off the bat of David Freese ended an early St. Louis threat. Unfortunately, the Brewers would eventually lose this game anyway. #68 – GoGo Robs CarGo – April 3, 2013 – Carlos Gomez makes the first of his record five home run robbing grabs of his Gold Glove season, when he took one away from Rockies left fielder Carlos Gonzalez. #55 – Gomez Scales Tal’s Hill…In a Manner of Speaking – June 18, 2013 – In this catch in the Brewers first series with the American League version of the Houston Astros, Carlos Gomez proved that concentration and timing are paramount in making a spectacular catch, but a little bit of fortune doesn’t hurt. Notice the distance marker on the CF wall? I figure Gomez was about 430 or so away from home plate when he literally laid out to make the catch. That’s gone by plenty at Miller Park. #30 – Gomez Does It Again to the Reds – September 15, 2013 – Gomez added another home run thievery to his collection when he scaled the wall in the top of the 9th at Miller Park with two on and two out. It kept the score knotted at five all after the Brewers scored once in the 7th and thrice in the 8th to tie the game. Gomez’s great catch allowed the Brewers to go on to win the contest when Sean Halton hit a walk-off home run in the bottom of the 9th off of Zach Duke. The win kicked off a modest four-game winning streak. #20 – Gomez Catches Ball, Votto Demands Proof – July 8th, 2013 – In what I thought would be the top defensive play for the Brewers in 2013, Gomez leaped high to take away a home run from Joey Votto, one that would have given the Reds the lead in the top of the 9th. Instead, Gomez’s catch ended it in rare home walk-off defensive fashion. Here is post-game audio from the final home game of the season. 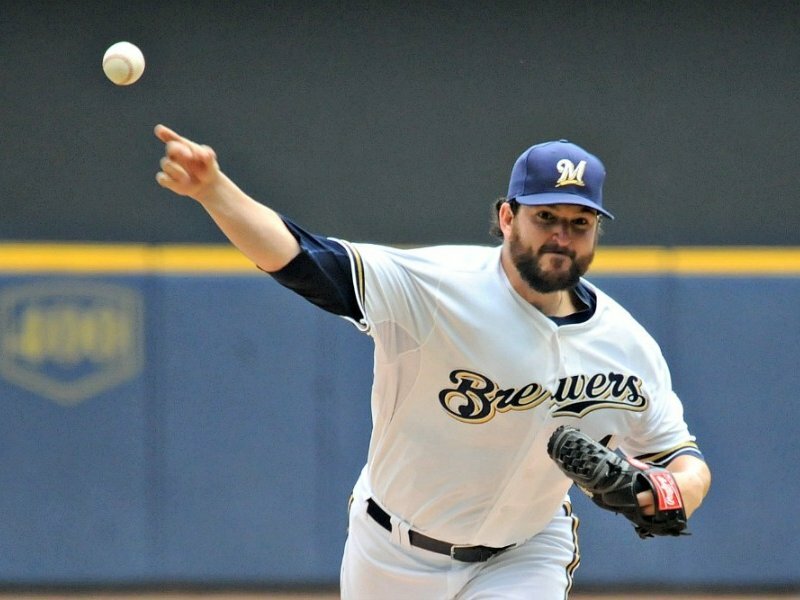 This includes my exclusive with Donovan Hand after the Brewers’ 6-4 win over the rival Cardinals. Jim Henderson on the game, facing Matt Adams with the game on the line, the realization of his dreams, Mariano Rivera, etc. Tonight at Miller Park, the Milwaukee Brewers hosted the NL Central Division-leading St. Louis Cardinals in the first of a four-game set. The third inning was particularly hospitable to the redbirds as they brought 11 men to the plate and scored six times. It was a rough and often unlucky inning for Wily Peralta who broke multiple bats, and was blooped, flared, and papercut to death by the Cards. There were a couple of hard hit balls as well but the majority of safe strokes would qualify for the “Punch & Judy” Hall of Fame. The six runs that the Cardinals scored in the inning would be all they got for the night, which added even more to the feelings of frustration. After the game, Roenicke talked about the troublesome inning for Peralta. Peralta would eventually get out of the third and pitch into the fifth before putting two on in the fifth. Alfredo Figaro entered and only allowed one hit over the next 2.2 innings. Peralta for his part understood that he made a bunch of good pitches in the third inning getting a couple of broken bats and suffering several weak hits but that it was obviously the difference in the game. “This inning (was) the difference in the game”, said Peralta. He said it was particularly upsetting to give up so many consecutive hits with two outs. As for St. Louis, Jake Westbrook did what Jake Westbrook does on the mound and allowed some baserunners, but only three consecutive fourth inning singles from Weeks, Gomez, and Maldonado were able to scratch a run across off of the Cardinal veteran. Luckily, “veteran” in this case also means “old” and Westbrook was lifted after 6.0 innings pitched for Joe Kelly. All Kelly did was get charged with two runs in 0.2 IP (raising the 8.31 ERA he entered the game with), and force Cardinal manager Mike Matheny to call on Mitchell Boggs. The new right-hander walked two — the first loaded the bases, the second scored the second run off Kelly — without recording an out. Matheny had to go get Trevor Rosenthal then who struck out Martin Maldonado to end the threat. Tom Gorzelanny continued the quality work out of the bullpen this evening with a quick and clean 8th inning. Rosenthal stayed in for the 8th inning. He got the scuffling Alex Gonzalez to pop out in foul territory to Yadier Molina, but then Blake Lalli scalded one what had to be a good 25 feet between a bewildered Molina and Rosenthal. Norichika Aoki reached on an error with one down, but resident hero Jean Segura could not come through on this night as he struck out swinging, chasing a high fastball. That brought Ryan Braun to the plate as the new tying run, and he singled up the middle to plate Lalli and put Aoki on third. The legend of Yuni B 2013 took a hit though as he struck out swinging to end the inning. Still, that made the score 6-4 in favor of the Cardinals heading to the 9th. The 9th saw Burke Badenhop get Carlos Beltran to bounce back to him, strike out Matt Holliday, and break the bat of Allen Craig on a soft liner to Segura. The last of the ninth, and the game, belonged to Edward Mujica and the Cardinals though. Weeks attempted to cut the lead in half but his deep drive to RF was hit about 30 feet too far left. Gomez singled and eventually would steal second. After Maldonado struck out looking, Gonzalez came through with an RBI single to CF. That allowed Ron Roenicke to send up Jonathan Lucroy to pinch-hit. Unfortunately, Lucroy would strike out to end the game with the Brewers falling a run short. After the game, Josh Prince was optioned down to the Nashville Sounds where he will get a chance to play every day. He admitted that at least a part of him was excited to play regularly again. Prince will work defensively at multiple positions in preparation for his eventual return. The move opens up a spot on the roster for the returning Aramis Ramirez. Ramirez will rejoin the team officially on Friday and be active for that evening’s game. 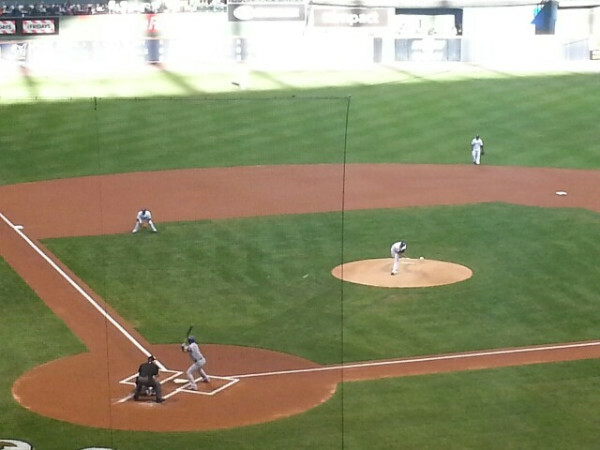 Hiram Burgos delivers his first career Major League pitch, a strike, in his debut on Saturday, April 20, 2013. 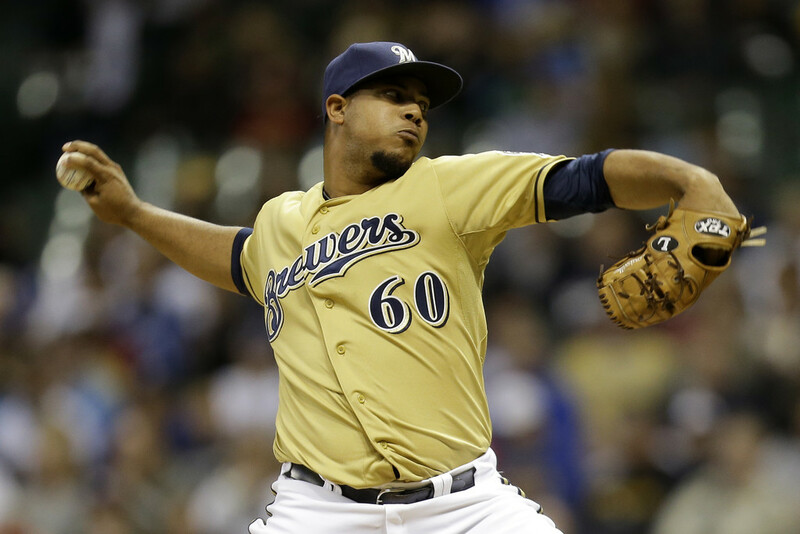 Miller Park was buzzing on Saturday night as the Brewers’ 2012 Minor League Pitcher of the Year, Hiram Burgos, made his Major League debut against the Chicago Cubs. Burgos’ first pitch was a strike, but despite allowing his first batter faced to reach on a bloop single, Burgos faced the minimum through three. A true test though would be the second time through the order. The hitters made a bit more contact, though none of it solid, in the fourth inning, leading to a Cubs’ run and a tie game. He was sharp throughout, keeping the visitors off balance with his repertoire of pitches. Back in February, Burgos told me that he throws four pitches: a fastball that sits between 88-92 MPH, a change up between 83-84, a cut fastball of 86-87 MPH, and a curveball down around 73 MPH. He utilized everything he had on this night, working through five full innings and not walking any hitters. He’d have gone farther as he finished the fifth at just 83 pitches, but Ron Roenicke pinch-hit for the young Puerto Rican as the offense had put runners at 2nd and 3rd with just one out. The Brewers ended up scoring two runs in the inning, putting Burgos in line for his victory MLB victory. Then Brandon Kintzler entered and locked the Cubs down in their half of the sixth before the Brewers tacked on two more runs in the sixth courtesy of the Cubs defense. “It’s been my dream to play in the big leagues. I’m happy to just help the team win. Six games in a row now. Burgos said that he was anxious to go out and warm up prior to the game, but once he threw his first pitch, he was comfortable again. He said that the plan he and catcher Jonathan Lucroy were working off of helped him settle in. The offense and bullpen gave Burgos the support he needed. Brandon Kintzler worked two perfect innings, striking out three. Michael Gonzalez struck out the side in his scoreless 8th inning, despite getting himself into a little trouble along the way. After allowing the lead off hitter to reach in the 9th, Gonzalez was lifted in favor of Burke Badenhop who retired the three Cubs hitters he faced in order to lock up a 5-1 victory. The W goes to Burgos who is now 1-0 in his career with a 1.80 ERA. Getting his first victory in his first career start when it takes some guys a long time (if ever) was something that didn’t escape Burgos. Having met Hiram Burgos on more than one occasion, I’m impressed by him. He’s a humble, grateful person who really appreciates the opportunity that he’s earned through impressive play. Those five runs came courtesy of some opportunistic offense who capitalized when Chicago defenders made errors. Officially there were three errors awarded in the game and they directly led to the Brewers scoring a pair of runs in both the fifth and sixth innings. The other run on the day was a no doubt solo home run off the bat of the white hot Jonathan Lucroy in the bottom of the second inning. Early runs can be crucial in helping a young pitcher settle in, so leave it to Burgos’ batterymate in the game to get it done. As for what’s next, Burgos wasn’t sure other than that he’s coming to Miller Park tomorrow. Roenicke also said that it needed to be looked at to determine whether Burgos could move into the bullpen between now and the next time the team requires a fifth starter, which is April 30th. Another possibility, though less likely from the sound of it, would be to not skip the turn when it could come up next. The third option would be to send Burgos back to Nashville where he’d make his next start and perhaps call up a relief pitcher for the next 10 days. Roenicke said that they talk about it on Sunday to “see where we are and what we want to do.” Roenicke admitted that the chance exists to not keep Burgos up for the next week and a half. But those are decisions for the management to make. For the players, a crisp victory in under three hours sends everybody home happy. Well, maybe not the Cubs.